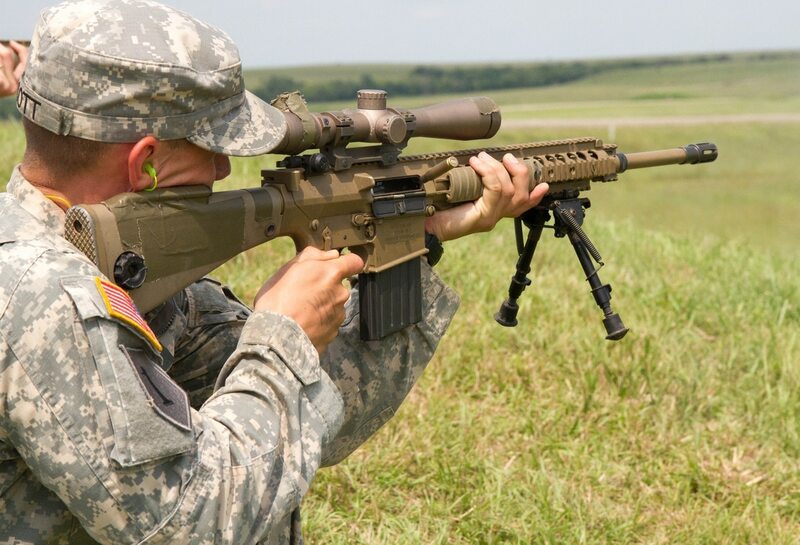 The Army just bought a new sniper rifle. The FedBizOpps.gov award notice said H&K will produce a maximum of 3,643 rifles over 24 months, as well as spare parts and depot support, at a max contract value of $44.5 million. There's a minimum purchase of 30 rifles for quality assurance testing. The Army did not immediately respond to requests for comment, nor did Heckler & Koch. It is unclear from the FedBizOpps posting which model rifle won the contract, and whether it's a commercially available gun, modification of one, or a new weapon. The gunmaker's website lists two precision rifles, one of which fits the Army's desire for a rifle smaller than the M110: the G28. The gas-operated rifle fires the same 7.62mm ammunition (NATO standard) as the M110. Heckler & Koch lists a minimum length of 96.5 cm (about 38 inches) and weight of 5.8 kg (12.7 lbs). That makes it nearly 6 cm (2.5 inches) shorter and 1.3 kg (3 lbs) lighter than the M110 (unloaded and without a suppressor). A Knight's Armament spokesman said the company had no comment at this time.